The practice was commissioned by Thenhotels LLP as lead consultants, architects and project managers to design and deliver a 130 bedroom, 8,000m2, Hilton Garden Inn hotel on Leeds Valley Park, in the Aire Valley, some four miles outside of Leeds City centre. 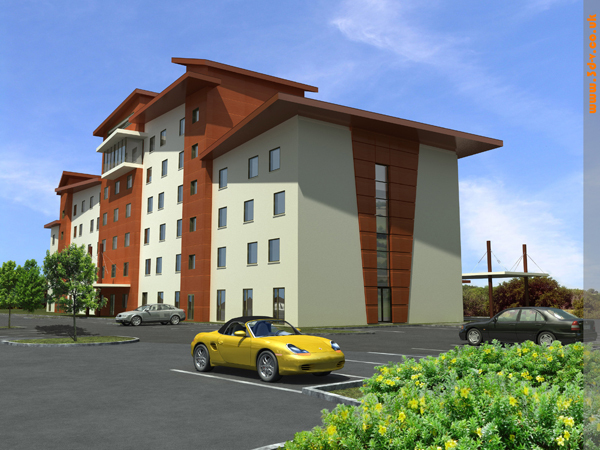 The site is one of the most elevated and exposed in the area, amidst a high quality business park of some 80,000m2. 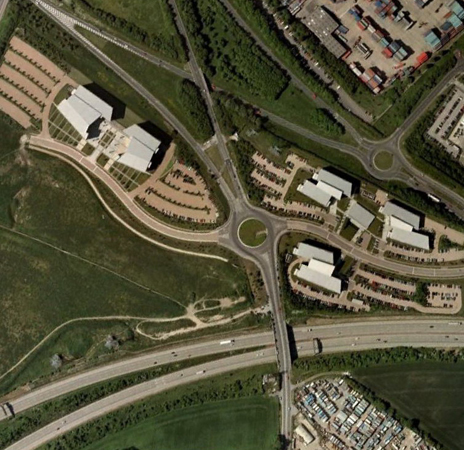 Both the business park owners and the planning authority required a visually strong building, as it will be viewed from considerable distances from the city and the adjacent M1 and M62 motorways and will become a local geographical and architectural landmark for this part of the Aire Valley. 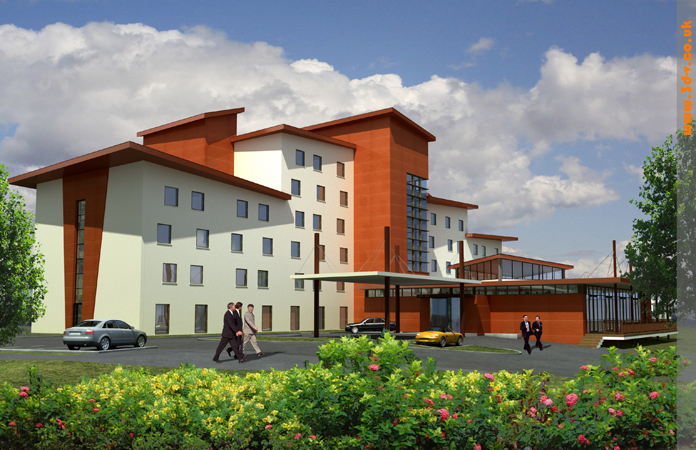 The strongest visual element to the south of the site comprises the bedrooms, function rooms and business suites. The storey heights vary in recognition of the buildings on sites adjacent, stepping down from six to four storeys, with a seven storey section forming the main stair and lift tower. The roofs, set at differing shallow angles, are trapezoidal in plan form and with substantial overhangs, creating a strong articulation to the roofscape, further emphasising the broken pattern of the façade and its fenestration and inset panels. On the south side, looking over the motorways to the Pennines beyond and on the top floor is the fitness suite, set in a projecting glass box. This very strong visual element, whilst providing a magnificent long view of the hill range for its occupants, will, most especially at night when illuminated, be a beacon, guiding visitors to the hotel from the motorway network. Where the bedrooms are set in a monolithic and vertically strong building form, set to withstand the buffeting winds across the Pennines, the public spaces and back of house are composed in an expansively glazed pavilion with a strong horizontal emphasis, a counterpoint to and protection from the verticality of the bedroom accommodation. The main restaurant is set adjacent to the banked entrance to the site and with its extended external deck, cantilevers out over the drop and provides distant views to the centre of the city of Leeds. In summer months this is seen as a social gathering point for the local business community. The proposed landscape on the site is richly diverse and offers water features, a private garden supporting the function suites, strong boundary planting and colourful mixtures to the building edge, creating a soft visual base. The result is a very controlled sculptural building using mixed colours, reflecting the quality and style of the business park, whilst at the same time providing subtle variations to create its own personality at this gateway to the Aire Valley.